Free Shipping Included! 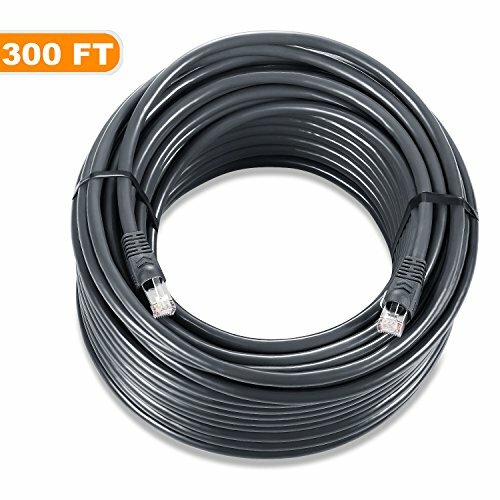 Outdoor Ethernet 300ft Cat6 Cable, IMONTA Shielded Grounded UV Resistant Waterproof Buried-able Network Cord by IMONTA at Wise Warthog. MPN: LYSB01MA3JGE6-CMPTRACCS. Hurry! Limited time offer. Offer valid only while supplies last. CAT6 / CAT5e: Supports both Cat6 and Cat5e applications. The RJ45 Shielded connector used for this cable fits perfectly in both Cat6 and Cat5e ports. CAPABILITY: IMONTA Cat 6 cables can support up to 10 Gigabits per second (10 times the bandwidth of Cat5e cables). Meets or exceeds Category 6 performance in compliance with the TIA/EIA 568B.2 standard. Backwards compatible with any existing Fast Ethernet and Gigabit Ethernet. CONSTRUCTION: 23AWG Pure Oxygen-free Solid copper wires. Aluminum foil, Shielded twisted-pair (STP), Cross Skeleton provide highest Shielded level, guarantee the fastest rate of signal transmission, see cable core structure photo. STRONG OUTDOOR BURIED-CAPABLE CABLE: International well-known brand exterior PVC provide Waterproof, anti-UV, anti-aging, anti-decomposition high performance outdoor Ethernet Cat6 cable, Grounded Wire reduce ESD eliminate interference signals when you buried this cable under the ground. PACKAGE: Cables length 100ft or more are pack in a little box, length below 100ft are pack in seal bag. If you have any questions about this product by IMONTA, contact us by completing and submitting the form below. If you are looking for a specif part number, please include it with your message.